• List the functions directly controlled by the GM III. 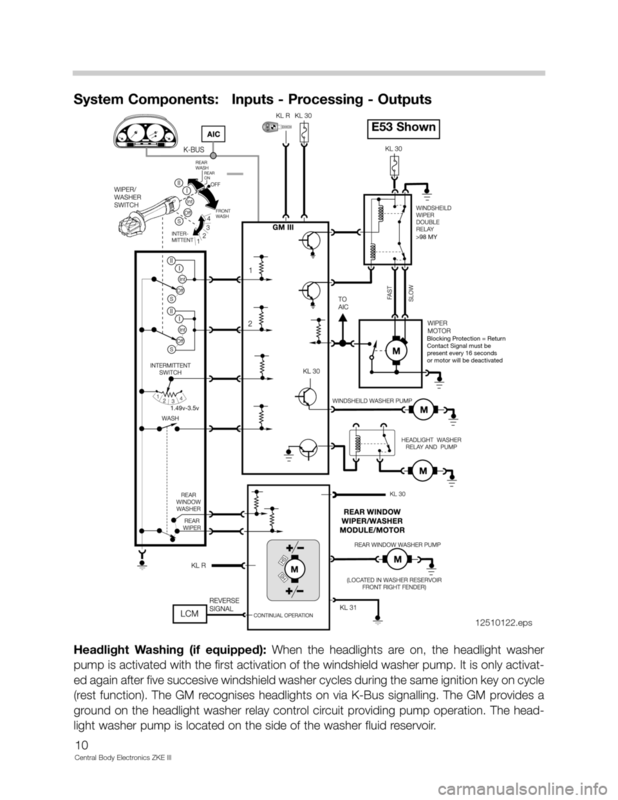 • Describe how the GM III recognizes the key position from the drivers door. • Explain what “convenience” features are available from the FZV key. • List what circuits are controlled by Consumer Cut Off. • Demonstrate how to Emergency disarm DWA. • Describe the changes in the 2000 MY Key. 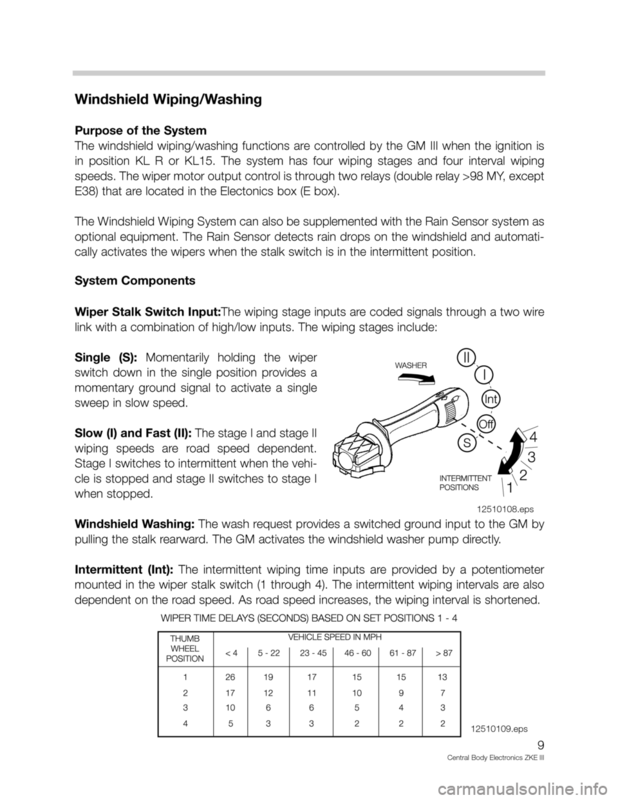 • Explain the electronic influence on power steering assist (Servotronic). • Demonstrate how to open the sunroof (in the event of an electrical malfunction). module, the General Module (GM). 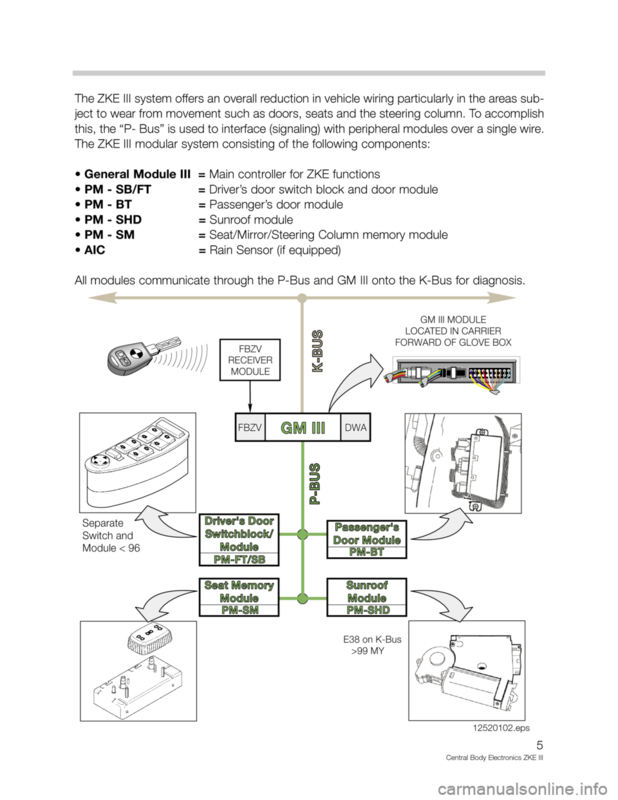 GM monitors the switched input voltage. cific output control of functions. 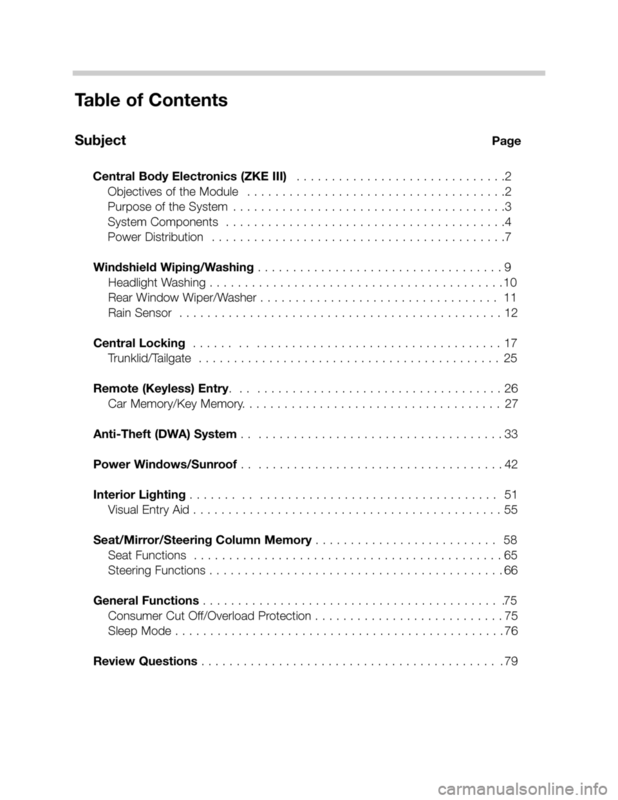 this, the “P- Bus” is used to interface (signaling) with peripheral modules over a single wire. 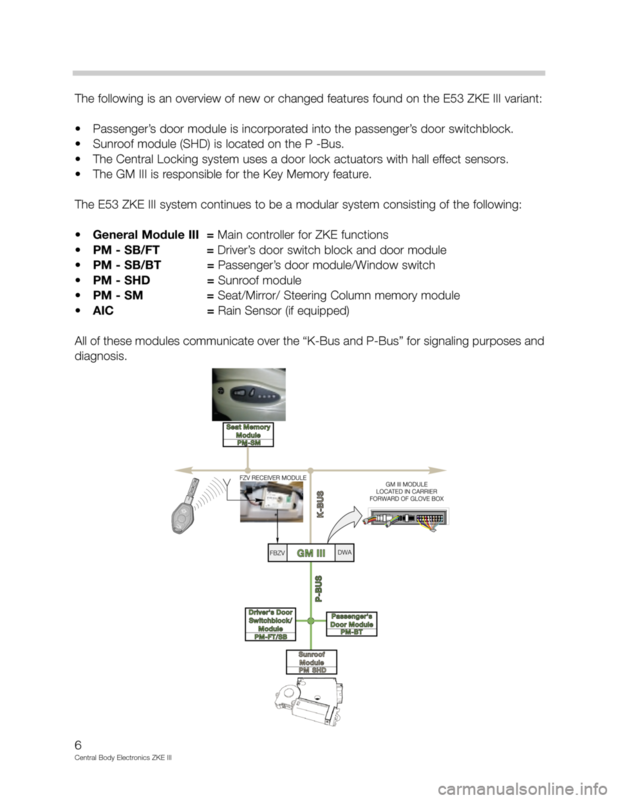 All modules communicate through the P-Bus and GM III onto the K-Bus for diagnosis. • Passenger’s door module is incorporated into the passenger’s door switchblock. • Sunroof module (SHD) is located on the P -Bus. • The Central Locking system uses a door lock actuators with hall effect sensors. 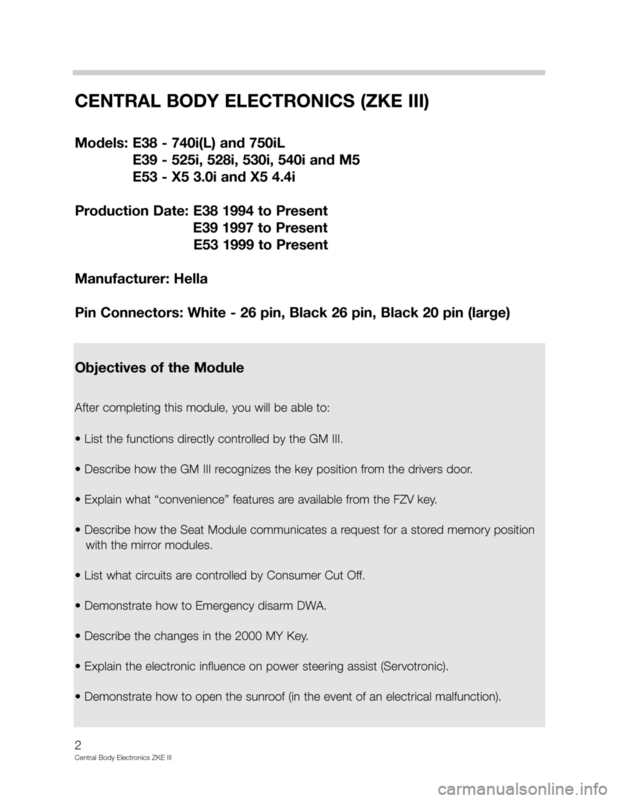 • The GM III is responsible for the Key Memory feature. E39 and E53 is inside the vehicle. The E38, E39 and E53 utilize high amperage fused power distribution centers. in the right rear area of the trunk, forward of the battery. 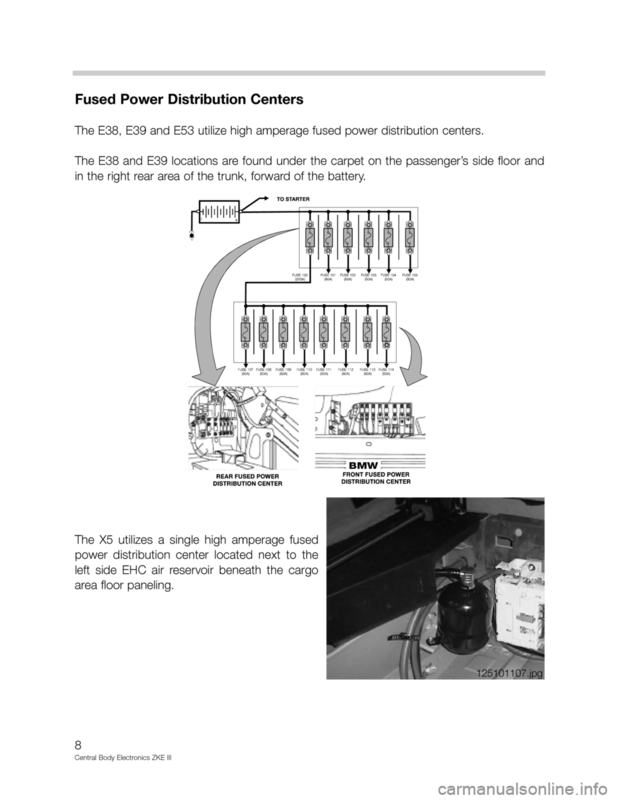 E38) that are located in the Electonics box (E box). cally activates the wipers when the stalk switch is in the intermittent position. wiping speeds are road speed dependent. pulling the stalk rearward. The GM activates the windshield washer pump directly. dependent on the road speed. As road speed increases, the wiping interval is shortened. light washer pump is located on the side of the washer fluid reservoir. 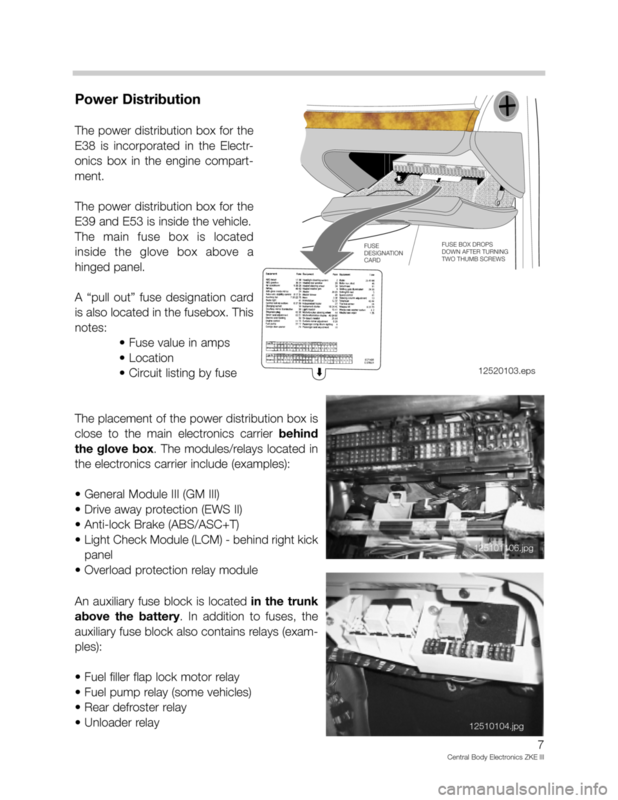 BMW 750IL 1995 E38 Central Body Electronics ZKE Manual view, print and download online for free. 80 Pages, PDF Size 4.14 MB. Search in BMW 750IL 1995 E38 Central Body Electronics ZKE Manual online. CarManualsOnline.info is the largest online database of car user manuals. 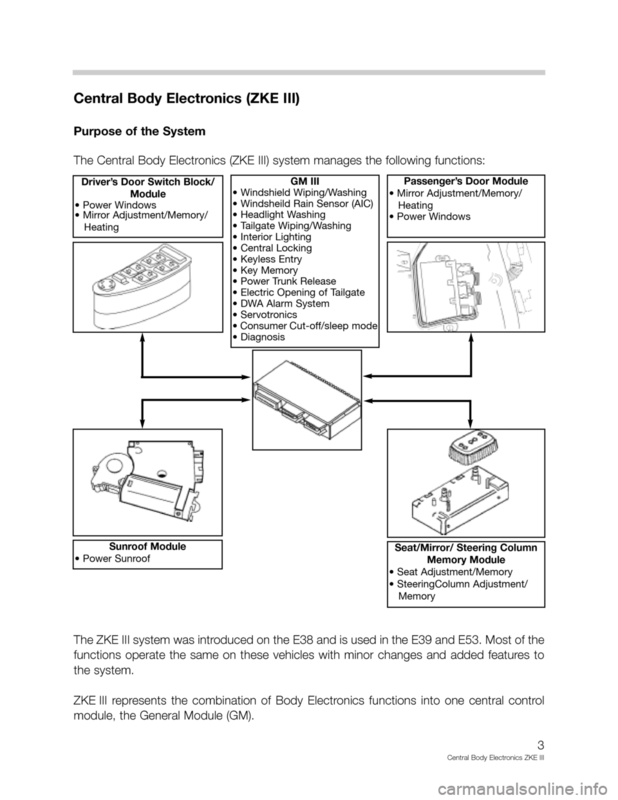 BMW 750IL 1995 E38 Central Body Electronics ZKE Manual PDF Download. 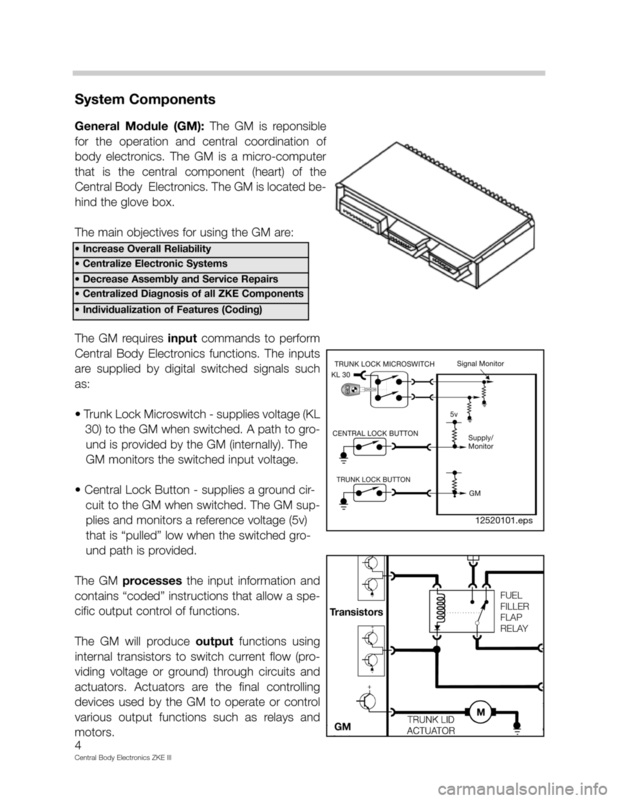 Table of Contents SubjectPage Central Body Electronics (ZKE III) . . . . . . . . . . . . . . . . . . . . . . . . . . . . . .2 Objectives of the Module . . . .